I made this recipe for my sister-in-law’s baby shower along with the salted caramel apple pie bars. They were very quick and easy. It makes about 16 2″ x 2″ brownies, and only two of them came back from the shower (where there were more desserts than you can imagine), so I think that’s a good sign. Preheat oven to 350 degrees. Spray an 8″ x 8″ baking pan with non-stick spray. Set aside. For the brownies: In a small bowl, beat the 2 eggs together. Set aside. Melt butter in a large microwave safe bowl in 0:30 second increments until melted. In the following order, mix in sugar, vanilla, cocoa powder, salt, food coloring, and vinegar. Whisk in the 2 eggs, then fold in the flour until just incorporated. Pour the batter into the baking pan, reserving 3-4 tbsp. for the cheesecake swirl. For the cheesecake swirl: With a hand mixer on medium speed, beat the cream cheese sugar, egg yolk, and vanilla for about one minute until completely smooth. Dollop spoonfuls of the cream cheese mixture on top of the brownie batter. Cover the cream cheese dollops with the reserved brownie batter. Glide a knife through the layers to create a swirl pattern. Bake the brownies for 28-30 minutes, or until a toothpick inserted into the middle comes out clean. 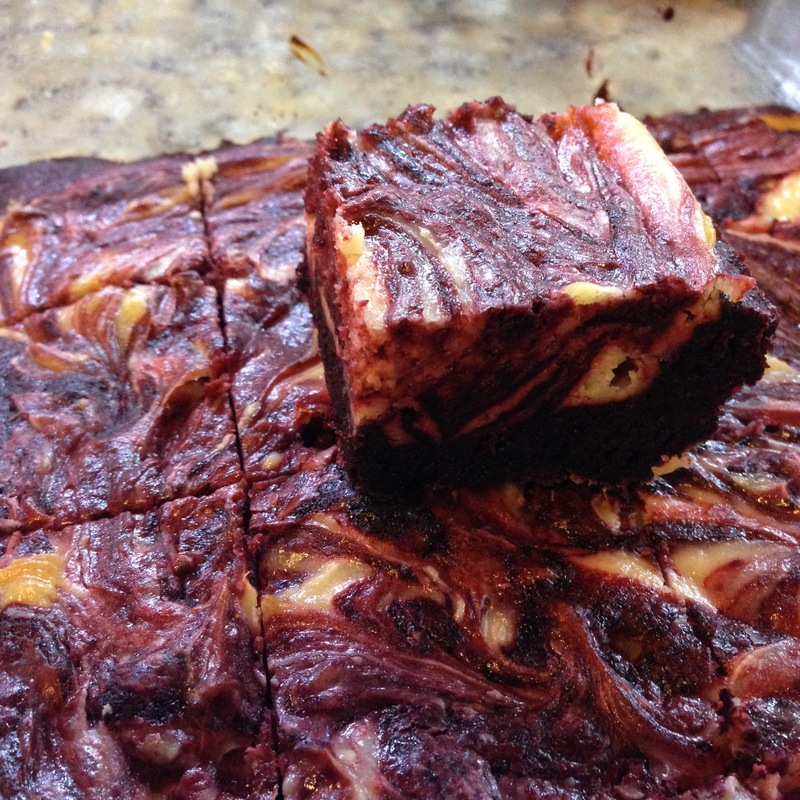 Allow brownies to cool completely before cutting into squares.